Available here are three EXCEL spreadsheets cited in Douglass J. Wilde′s book ″Post-Jungian Personality Theory for Individuals and Teams″, draft 1 May 28, 2013, SYDROSE LP, San Jose, CA, USA (final book will be available in Oct. 2013). The first two use percentage scores either from the Personality Questionnaire on p. 17 or from any variant of the Myers-Briggs Personality Type (MBTI) questionnaire with its numerical scores (preference clarity indices PCI) converted to percent of each variable range. The third uses the PCI scores of the MBTI Form 30 directly with the range of 30 taken into account. No conversion to percentage is needed. Activate the next button to find your psychological and functional attitudes, functional map, and scores in Jung's cognitive modes. The page opens in a new tab or window. My new 73-page book “Post-Jungian Personality Theory for Individuals and Teams” corrects the inaccuracies of the Myers Type Table. These errors occurred because neither Myers nor Jung knew how to transform questionnaire scores into the cognitive mode scores of Jung′s personality theory as eventually derived in my e-book “Jung′s Personality Theory Quantified” (JPTQ). Correcting these mistakes will hopefully arrest the current unfortunate decline of the reputation of the MBTI questionnaire itself, which remains as good as ever despite its current misinterpretation. 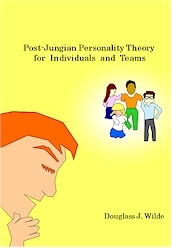 The POST-Jungian theory is based, not on Jung′s cognitive modes, but rather on the team roles defined in JPTQ and my earlier e-book “Teamology”. In addition to this formulation, essential for type counselors and individuals, there are two chapters for teamologists and team members. One gives a greatly simplified method for constructing cognitively diverse teams using only questionnaire scores without further calculation. The other tells how to identify the roles from the scores, using the above open source spreadsheets. This role information, consolidated into only seven newly defined “Pactivities”, accelerates the organization of a well communicating team, even as small as a duet or trio. $15.00 + Sales tax + Shipping and Handling $6.00 = $22.31 Bulk order discount is available. Send mail to admin08@sydrose.com to request a quote for a specific number of copies. Use ″PostJungian″ in the mail subject. Otherwise, English mails are often mistaken for SPAM. A single order should also be confirmed via email to the above. Please expect to receive a return acknowledgment mail within 5 business days.